AVAILABLE! Twinkle Gorgeous Black Gold Female CKC Havashire Put The Twinkle In Your Eye! Meet Twinkle! She is such a gorgeous little doll, with her big, enchanting, dark eyes and her lush locks of shiny black and gold hair. She has a darling teddy bear face. Twinkle has a great disposition and loves puppy kisses and attention. She loves everyone and everyone seems to adore her! She is the perfect size to go everywhere with you. If you are looking for a loving companion don’t miss this opportunity to make Twinkle your very own baby! She is waiting for that special family will it be you? She promises to make your life amazing! She has been prayed over for finding her forever home . I’m Twinkle and I’m one of four females in my litter of five. My litter name theme is after heavenly bodies. I have yorkie markings like my daddy with gorgeous black and gold with a pinch of white on my muzzle and white patch on my chest. Oh yes don’t forget I also has my full tail that will make you giggle every time I wags it. My mommy Holly is a gorgeous 7.8 lb Havanese and My Daddy Lil Man is the cutest 5 lb Yorkie. My birth weight only 4.6 oz . My estimated adult weight is 4.8-6 lbs lbs My designer breed is Havashire A/K/ Yorkinese and I’m the cutest little guy and I’m ready to steal your heart with my winning personality! Paypal as cash price send as family and friends Write Memo Female Havashire Twinkle. AVAILABLE! Star Gorgeous Black Gold Female CKC Havashire With The Cutest Docked Tail! Looking for a loving pup to call your own? Then look no further, Star is here! Star is the sweetest pup around. Once you gaze into her eyes, you’ll be hooked for life. This cutie promises to bring so much love and fun into your life. Wouldn’t you love to have her? Star sure hopes so because she knows you won’t regret it. Get ready for all the good times ahead! I’m Star and I’m one of four females in my litter of five. My litter name theme is after heavenly bodies. I have yorkie markings like my daddy with gorgeous black and gold with a pinch of white on my chin and just look at the white strip down my chest and to top off my beauty look at white on all four paws. Oh yes don’t forget I also has the cutest docked tail that will make you giggle every time I wags it. My mommy Holly is a gorgeous 7.8 lb Havanese and My Daddy Lil Man is the cutest 5 lb Yorkie. 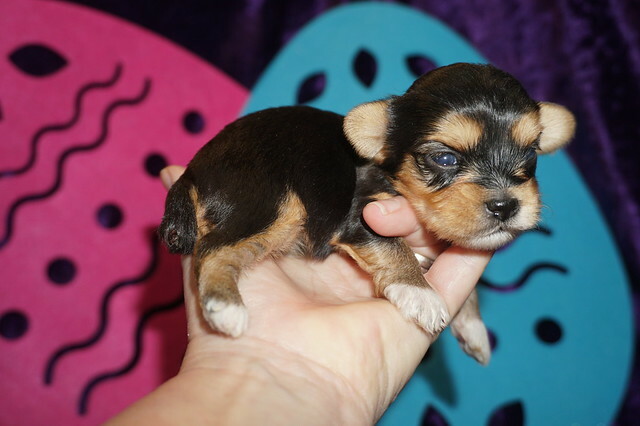 My birth weight only 4.1 oz so my estimated adult weight is 4.8 -5.8 lbs My designer breed is Havashire A/K/ Yorkinese and I’m the cutest little guy and I’m ready to steal your heart with my winning personality! Paypal as cash price send as family and friends Write Memo Female Havashire Star. AVAILABLE! Sunshine Gorgeous Black Gold Female CKC Havashire Ready To Warm Your Heart! Sunshine is so adorable! Her winning personalty will melt your heat upon arrival. Sunshine will bring your family a lot of happiness into you life. She has a way of making people smile. If you are looking for a companion and friend that will make you life complete you have found her. Sunshine will do all of that plus more. So what are you waiting for call now and get her coming you will be pleased with her bouncy little temperament when she arrives. Call now..
I’m Sunshine and I’m one of four females in my litter of five. My litter name theme is after heavenly bodies. I have yorkie markings like my daddy with gorgeous black and gold with a pinch of white on my muzzle and just look at the white strip down my chest. Oh yes don’t forget I also has my full tail that will make you giggle every time I wags it. My mommy Holly is a gorgeous 7.8 lb Havanese and My Daddy Lil Man is the cutest 5 lb Yorkie. My birth weight only 5.4 oz . My estimated adult weight is 5-6 lbs lbs My designer breed is Havashire A/K/ Yorkinese and I’m the cutest little guy and I’m ready to steal your heart with my winning personality! Paypal as cash price send as family and friends Write Memo Female Havashire Sunshine. AVAILABLE! Moon Dust Gorgeous Black Gold Male CKC Havashire With The Cutest Docked Tail! Talk about gorgeous! This cutie has everything you could ask for: looks, personality and attitude! He loves to walk around strutting his stuff! He’s pre-spoiled and is treated like the little prince he is. Moon Dust will come with a lifetime of puppy kisses and cuddles so as you see you can’t go wrong with this cutie. Moon Dust is so anxious to meet his new family. His bags are packed and ready to go! He has been prayed over for finding his forever home . I’m Moon Dust I’m the only male in my litter of five. My litter name theme is after heavenly bodies. I have yorkie markings like my daddy with gorgeous black and gold with a pinch of white on my chin under my neck and the tip of my left back paw. Oh yes don’t forget I also has the cutest docked tail that will make you giggle every time I wags it. My mommy Holly is a gorgeous 7.8 lb Havanese and My Daddy Lil Man is the cutest 5 lb Yorkie. I’m toy size so estimated adult weight is 5.8-6.8 lbs My designer breed is Havashire A/K/ Yorkinese and I’m the cutest little guy and I’m ready to steal your heart with my winning personality! AVAILABLE! Sky Gorgeous Black Gold Male CKC Havashire With The Cutest Docked Tail! If you like to snuggle as much as Sky does, then this puppy is the one for you. The cuddle bug loves movie nights, afternoon naps, and snuggle sessions. She loves anything relaxing really, just as long as she gets to do it with you. To change things up a bit, she’d like to go on a nice walk around the block on a sunny day, but she’ll be looking forward to getting back home to cuddle up afterwards. Add this snuggle bug to your family today. She’ll be waiting by the phone for your call. I’m Sky and I’m one of four females in my litter of five. My litter name theme is after heavenly bodies. I have yorkie markings like my daddy with gorgeous black and gold with a pinch of white on my chin and just look at the white strip down my chest. Oh yes don’t forget I also has the cutest docked tail that will make you giggle every time I wags it. My mommy Holly is a gorgeous 7.8 lb Havanese and My Daddy Lil Man is the cutest 5 lb Yorkie. 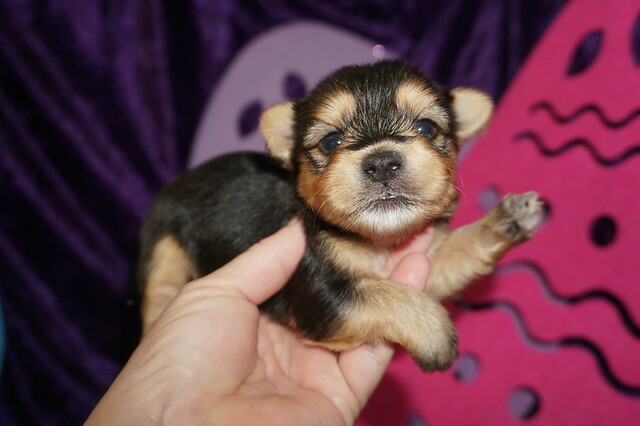 My birth weight only 3.9 oz so my estimated adult weight is 4.8 -5.8 lbs My designer breed is Havashire A/K/ Yorkinese and I’m the cutest little guy and I’m ready to steal your heart with my winning personality! Paypal as cash price send as family and friends Write Memo Female Havashire Sky. HAS DEPOSIT! Linguine Smallest Male CKC Havashire A/K/A Yorkinese of His Litter! My new name is Luke and my new home is Palm Coast, FL . Linguine is one of four boys in this litter of five. Their name theme is after Italian food. Linguine is mostly black with white markings and gold highlights on cheeks and brows. He is the smallest of his litter. He has a gorgeous full tail that will make you giggle as he wags it. 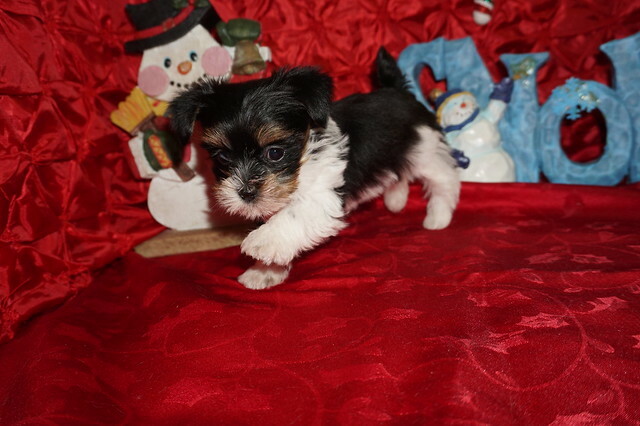 He is toy size so estimated adult weight is 5-6 lbs unlike regular Havashire a/k/a Yorkinese that weigh 18-22 lbs He is a cutest little guy and he is ready to steal your heart with his winning personality! SOLD! Zitto Sweetest Male CKC Havashire A/K/A Yorkinese! Zitto is one of four boys in this litter of five. Their name theme is after Italian food. Zitto is mostly black with white markings and gold highlights on cheeks and brows. He has a gorgeous full tail that will make you giggle as he wags it. 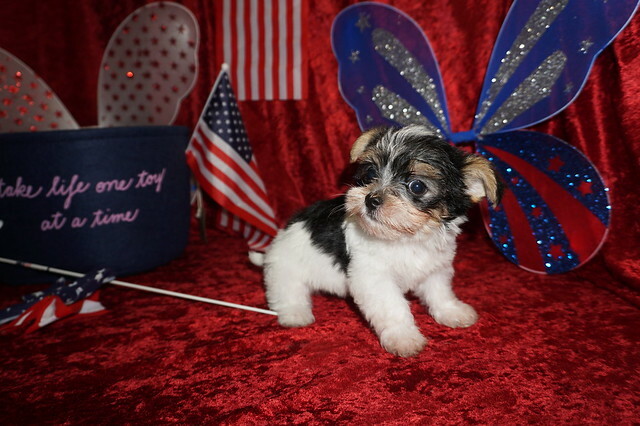 He is toy size so estimated adult weight is 5-6 lbs unlike regular Havashire a/k/a Yorkinese that weigh 18-22 lbs He is a cutest little guy and he is ready to steal your heart with his winning personality! HAS DEPOSIT! 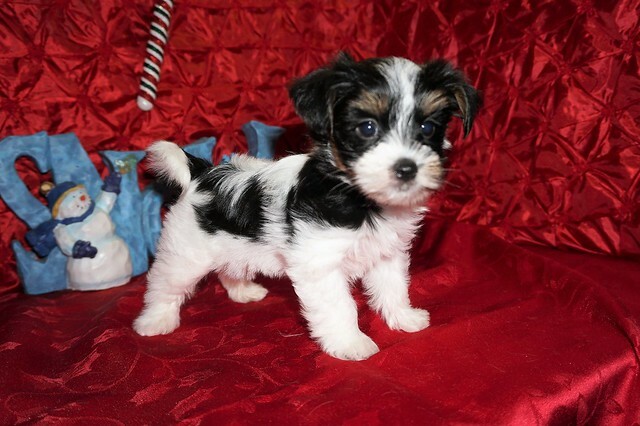 Fritta Gorgeous Female CKC Havashire A/K/A Yorkinese! Stop right there! You have found your new baby boy. Cannoli is as adorable as a puppy can be. He will be sure to shower you with his puppy love kisses every morning just to let you know how much you mean to him. He will come with a lifetime of puppy love just for you. Don’t miss out on the newest addition to your family. He will be sure to steal your heart away. Waiting on his new name and my new home Jacksonville, FL . Fritta is the only girl in this litter of five. Their name theme is after Italian food. Fritta is mostly white with black markings and gold highlights on her cheeks and brows. Shee has a gorgeous full tail that will make you giggle as she wags it. 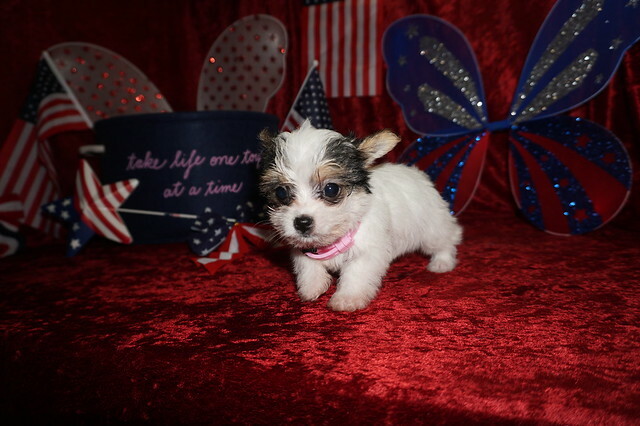 She is toy size so estimated adult weight is 5-6 lbs unlike regular Havashire a/k/a Yorkinese that weigh 18-22 lbs She is a cutest little gal and she is ready to steal your heart with her winning personality! HaAS DEPOSIT! 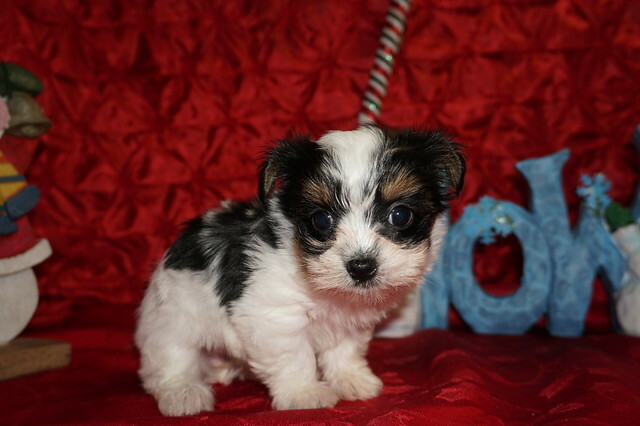 Mozzarella Gorgeous Black / White & A Touch Of Gold Male CKC Havashire A/K/A Yorkinese! This adorable baby boy is ready to be shown off to your friends! Mozzarella is a lovable puppy that wants to light up your life. Mozzarella will will come with so many puppy kisses you will always feel loved. He will love running around town with you doing errands or snuggling at home to relax. Mozzarella is eager to find his forever home. Don’t miss out on this spectacular companion. Waiting on his new name and my new home is Ponte Vedra Beach, FL. Mozzarella is one of four boys in this litter of five. Their name theme is after Italian food. Mozzarella is mostly white with black markings with a touch of gold on his cheeks and brows. He has a gorgeous full tail that will make you giggle as he wags it. 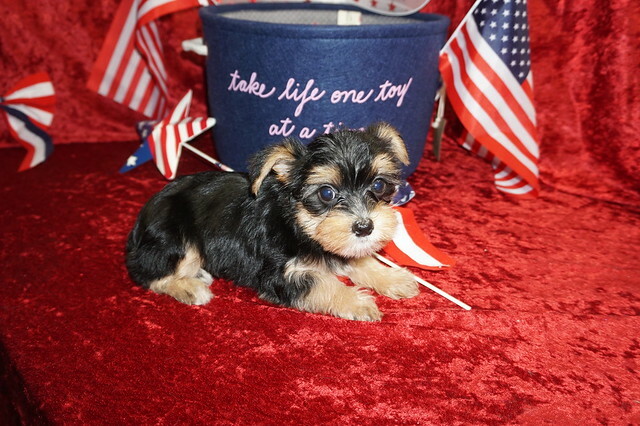 He is toy size so estimated adult weight is 5-6 lbs unlike regular Havashire a/k/a Yorkinese that weigh 18-22 lbs He is a cutest little guy and he is ready to steal your heart with his winning personality! HAS DEPOSIT! 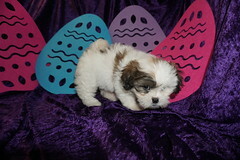 Cannoli Gorgeous Black / White & A Touch Of Gold Male CKC Havashire A/K/A Yorkinese! Waiting on his new name and my new home is Middleburg, FL . Cannoli is one of four boys in this litter of five. Their name theme is after Italian food. Cannoli is mostly black with markings. He has a gorgeous full tail that will make you giggle as he wags it. 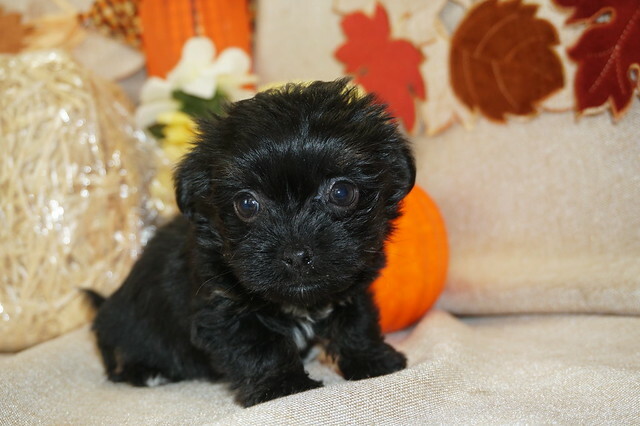 He is toy size so estimated adult weight is 5-6 lbs unlike regular Havashire a/k/a Yorkinese that weigh 18-22 lbs He is a cutest little guy and he is ready to steal your heart with his winning personality! 2 Puppies SORRY SOLD OUT! SOLD! Nugget Cutiest Tiny Male CKC Havashire That Is So Lovable! Meet Nugget. This handsome little boy is quite the looker. Just take a look at his shiny coat and adorable face. You and your family will fall in love in seconds. You guys will be the talk of the town. He knows he’s a winner and walks with confidence everywhere he goes. You’ll be proud to call this boy your very own. Hurry and bring Nugget home as soon as possible. Nugget has so much love to give his new family. Call about this sweet boy now! Waiting on my name and my new home is Ponte Vedra Beach, FL . What a cutie he is He has been prayed over for finding her forever home . Nugget is the only boy in this litter of two and the smallest of the two. Their name theme is small dogs. He is a gorgeous Brindle color with white markings on h paws, chest and chin. He also has her full tail that will make you giggle as he wags it. 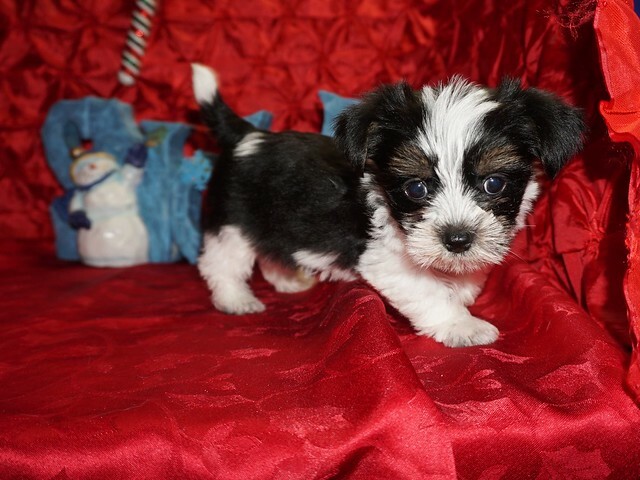 he is toy size so estimated adult weight is 5-6 lbs unlike regular Havashire that weigh 18-22 lbs His Havanese mom is a 7.8 lb silver Havanese and Dad is a 4 lb Yorkie. 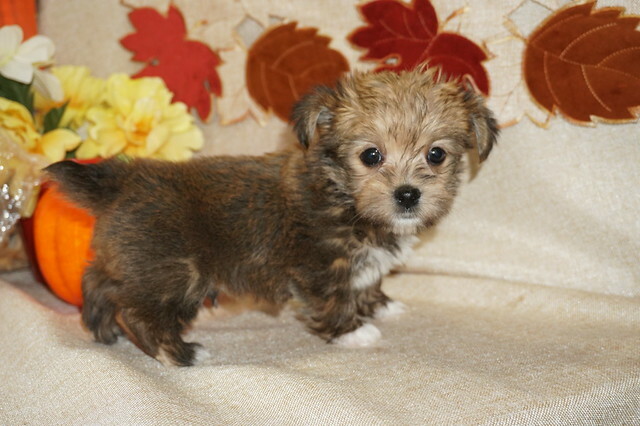 He is the cutest little guy and he is ready to steal your heart with his winning personality! SOLD! Peanut Adorable Black Female CKC Havashire Is Perfect For You! Meet Peanut! This beautiful, baby-doll faced princess can’t wait to venture off to her new home. Her coat is absolutely beautiful and perfect to pet all day! She hopes you like getting puppy kisses because she’s not shy about giving them out! Peanut will arrive with a lifetime of love and puppy kisses. She is so excited to meet you. She can’t wait to jump into your arms and shower you with puppy kisses! Don’t miss out! My new mommy named me Peanut right after I was born and my new home is. What a cutie she is with her gorgeous rich coloring of black and a touch of white on her paws, chest and chin. She has been prayed over for finding her forever home . Peanut is the only girl in this litter of two. Their name theme is small dogs. She is a gorgeous black silky hair with a touch of white on her paws, chest and chin. She also has her full tail that will make you giggle as she wags it. 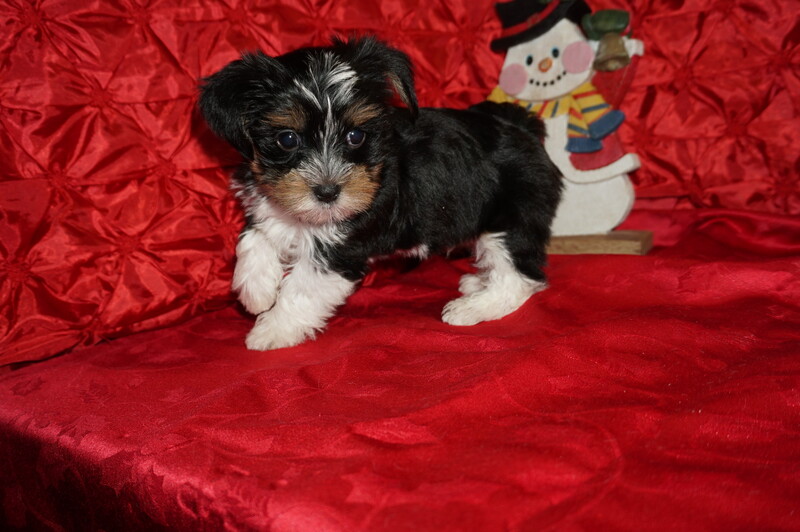 She is toy size so estimated adult weight is 6-8 lbs unlike regular Havashire that weigh 18-22 lbs Her Havanese mom is a 7.8 lb silver Havanese and Dad is a 4 lb Yorkie. She is the cutest little gal and she is ready to steal your heart with her winning personality! JUNE HAVASHIRE PUPPIES ARE BORN! We are proud to announce Lolo and Lil Man just welcomed their first generation CKC Havashire puppies into the world on March 8, 2018! SOLD! Gigabytes Only Female CKC Havashire And Gorgeous Tri Color! Gigabyte is a precious little girl with lots of love to go around. She loves to play and give puppy kisses to all her human friends. She will be the talk of the town with her coat is white with black on her tail around her eyes and ears and a touch of gold. 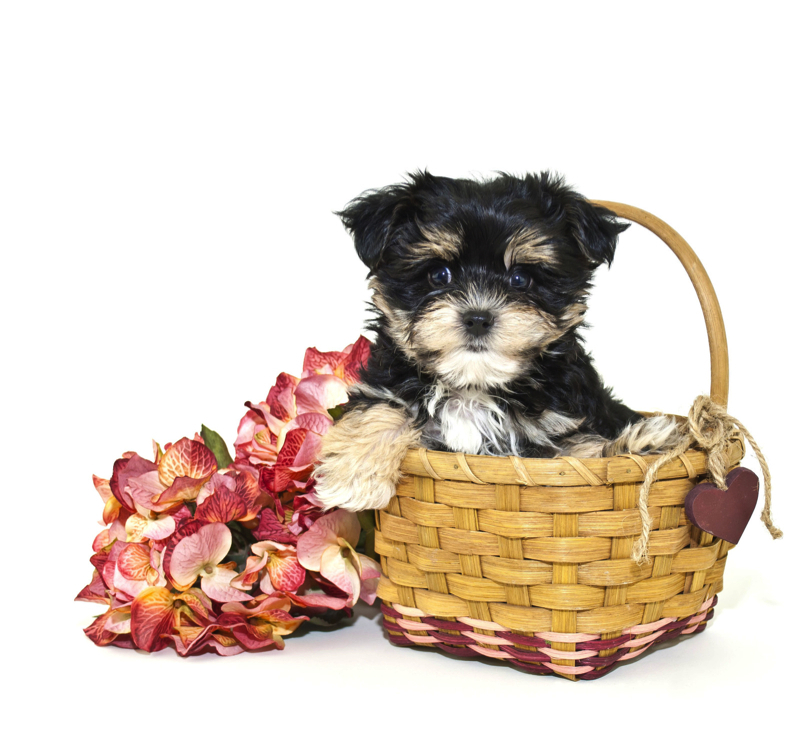 Wouldn’t you just love to make this sweet pup yours today? Gigabyte is more than ready to shower you with all of the love she has to offer. Gigabyte will arrive healthy, happy, and a lifetime of puppy kisses. This cutie promises to bring much joy to your home. Don’t miss out on making this special girl your very own. Puppy kisses are waiting! My new name Tipi and my new home is Jacksonville, FL. What a cutie she is with her gorgeous tri color. She has been prayed over for finding her forever home . Gigabyte is the only female in this litter of four. Their name theme is after computer memory. Gigabyte is gorgeous white with the only color on her head and tail the black is on her tail and on her eyes and ears and highlights of gold color on her eyebrows and cheeks. She also has the cutest full tail that will make you giggle as she wags it. 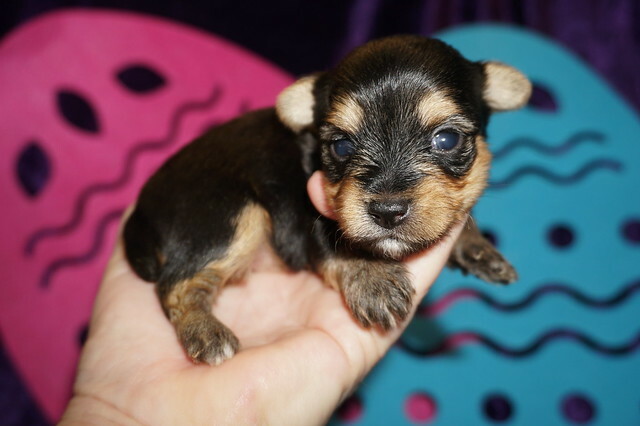 She is toy size so estimated adult weight is 5-6 lbs unlike regular Havashire that weigh 18-22 lbs She is a cutest little girl and she is ready to steal your heart with her winning personality! SOLD! Kilobytes Gorgeous Tri- Color Male CKC Havashire With The Cutest Docked Tail! Get ready for nonstop action with Kilobyte at your side! This great, active baby boy will have you playing with him in no time. You just can’t help but want to play with him when you see him. Kilobyte loves to go on adventures and hopes you’ll join him on them. Whether chasing the butterflies in the yard, or finding the cookie under the sofa, this impressive little boy will have you laughing and loving him in no time. Don’t miss out on making him part of your family. My new name is Ace and my new home is. What a cutie he is with his gorgeous rich coloring of black and little gold taking after his Yorkie breed. He has been prayed over for finding his forever home . Kilobytes is one of three boys in this litter of four. Their name theme is after computer memory. Kilobytes is the only male with the tri color in his litter and he has the gorgeous black white and gold color and the cutest gold eyebrows. He also has the cutest docked tail that will make you giggle as he wags it. 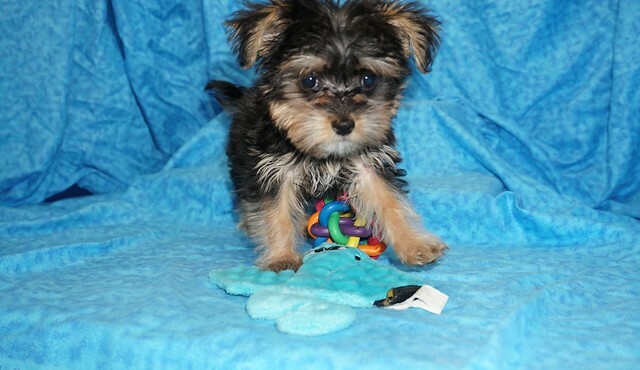 He is toy size so estimated adult weight is5-6 lbs unlike regular Havashire that weigh 18-22 lbs He is a cutest little guy and he is ready to steal your heart with his winning personality! SOLD! Terabytes Largest Male CKC Havashire Of His Litter But Just A Cuddle Bear! Terabyte is the sweetest boy and will just be a little cuddle bear! Imagine all the fun you’ll have with this cutie. You can take him for nice walks in the park or just cuddle with him on those lazy, rainy afternoons. Thorn will come with a lifetime of puppy kisses and hugs. This cutie has so much love to give and he wants to share it with you. Don’t miss out! Waiting on my new name and my new home is Lake Mary, FL. Terabyte is one of three boys in this litter of four. Their name theme is after computer memory. 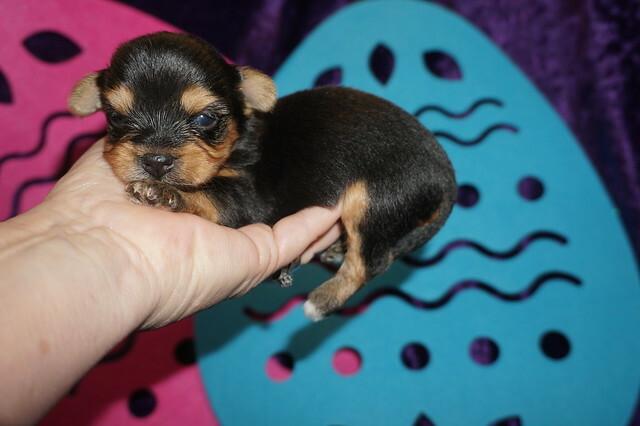 Megabytes is the largest of his litter and he has the yorkie markings a gorgeous black and gold with white on his chin and chest. He also has the cutest full tail that will make you giggle as he wags it. He is toy size so estimated adult weight is 7-9 lbs unlike regular Havashire that weigh 18-22 lbs He is a cutest little guy and he is ready to steal your heart with his winning personality! SOLD! Megabytes Gorgeous Black Tan Male CKC Havashire With The Cutest Docked Tail! Megabytes Male CKC Havashire $2000 Special $1500 Ready 6/13 SOLD MY NEW HOME ORMOND BEACH, FL 2.5 LBS 12 WEEKS OLD w/ ALL HIS PUPPY VACCINES INCLUDING RABIES! Megabyte is a sweet baby boy. He holds his own with his litter, yet is a sweet snuggler. Megabyte is always ready to make you laugh with all the funny, little things he does. Megabyte comes with a lifetime of love. He has a very loving personality and he’s looking for a home where he will be able to share that love with you. Bring this sweet, baby boy home soon. My new name is Parker and my new home is Ormond Beach, FL. Megabytes is one of three boys in this litter of four. Their name theme is after computer memory. 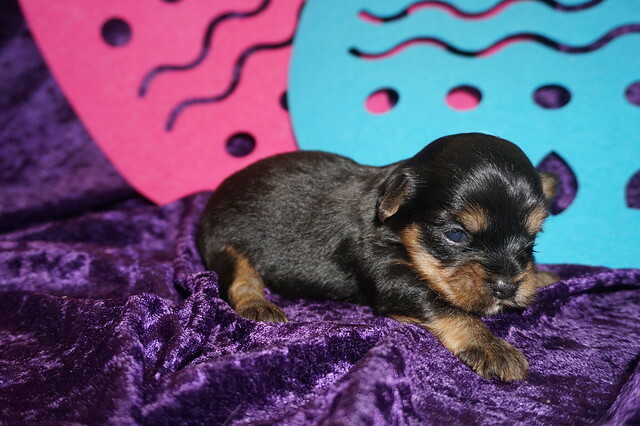 Megabytes is the largest of his litter and he has the yorkie markings a gorgeous black and gold with white on his chin. He also has the cutest docked tail that will make you giggle as he wags it. He is toy size so estimated adult weight is 7-9 lbs unlike regular Havashire that weigh 18-22 lbs He is a cutest little guy and he is ready to steal your heart with his winning personality!